The Dextre robot on the International Space Station is seen near the Robotic Refueling Mission testbed outside the International Space Station in this camera view in January 2012. An International Space Station experiment testing the ability of robots to repair and refuel orbiting satellites has resumed, after being stalled for a week by a software glitch. NASA's Robotic Refueling Mission (RRM) resumed operations Tuesday (Jan. 22) after engineers finished analyzing loads and software limits for the space station's Dextre robot, agency officials announced in a Tuesday mission update. 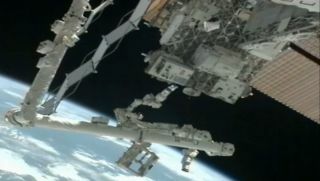 RRM calls for Dextre, which sits at the end of the orbiting lab's huge Canadarm2 robotic arm, to perform simulated refueling and repair tasks on a washing-machine-size platform affixed to the station's exterior. The latest round of RRM experiments started Jan. 14 and was expected to last about 10 days, but a software glitch halted activities after just a day. The RRM module, which consists of activity boards and tools necessary to demonstrate on-orbit refueling, launched to the station in July 2011 aboard the space shuttle Atlantis, which was making the last flight in the shuttle program's 30-year history. The experiment's goal is to demonstrate technology that could someday fix and refuel orbiting satellites robotically, thereby extending their lives and potentially saving satellite operators billions of dollars over the long haul. Such work can be challenging, since current satellites were generally not designed to be serviced. The first RRM experiments began last year, when controllers on the ground used the two-armed Dextre to snip some wires with minimal clearance. The latest round of activities will be more complex and involved, as Dextre will snip more wires, unscrew caps and pump simulated fuel, NASA officials have said.